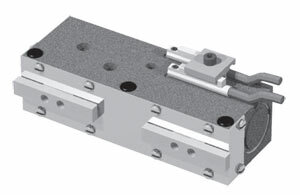 RPLC Series Gripper is a pneumatic parallel gripper with excellent parallelism and accuracy between the gripper mounting surface and jaw surface. Jaws are front mounted and are supported with 'Dual-V" roller bearings to provide low friction motion and are preloaded for maximum support and zero side play. This gripper supports longer finger length designs compared to other grippers of similar sizes. These grippers are available in stroke lengths from 6.4 to 19.1mm (0.25 to 0.75") with a grip force from 116 to 160 N (26 to 36 lbs). RPLC gripper are Clean Room and Harsh Environment rated with a corrosion resistant shield to protect the drive and bearing mechanism from chips and other contaminants. All internal components are lubricated with clean room grade lubricant and the scavenger port can be used with vacuum to prevent escapement of particulate. It can also be used with pressure to repel particulate away from the jaws. This gripper is designed for class 10 clean room, FDA, and medical applications. Linear motion pneumatic components are double acting cylinders that require a dry air supply with filtering to 40 microns or better. For best control of pneumatic components, flow control valves (regulating out) should be installed to regulate the speed of the device. Position sensors can easily be added to motion components to detect the end of travel positions of the slides, they are the standard method of communication with the PLC and are available in inductive or magneto resistive sensing styles and come in both PNP or NPN sourcing signals. Seal Repair Kits Available: Yes *Addition of lubrication will greatly increase service life. 참고: Cables and sensors sold sepatately.